Climate change affects populations of forest insect pests in a number of ways. We reviewed the most recent literature (2013–2017) on this subject including previous reviews on the topic. We provide a comprehensive discussion of the subject, with special attention to insect range expansion, insect abundance, impacts on forest ecosystems, and effects on forest insect communities. We considered forest insects according to their major guilds and biomes. Effects of climate change on forest insects are demonstrated for a number of species and guilds, although generalizations of results available so far are difficult because of species-specific responses to climate change. In addition, disentangling direct and indirect effects of climate change is complex due to the large number of variables affected. Modeling based on climate projections is useful when combined with mechanistic explanations. Expansion of either the true range or the outbreak range is observed in several model species/groups of major insect guilds in boreal and temperate biomes. Mechanistic explanations are provided for a few species and are mainly based on increase in winter temperatures. In relation to insect abundance, climate change can either promote outbreaks or disrupt trophic interactions and decrease the severity of outbreaks. There is good evidence that some recent outbreaks of bark beetles and defoliating insects are influenced by climate change and are having a large impact on ecosystems as well as on communities of forest insects. There is general consensus among scientists that the global climate is changing at an unprecedented rate, with many regions experiencing warming trends, frequent high temperature extremes, and shifts in precipitation patterns [1••]. An increase of 0.61 °C in global mean temperature recorded since the beginning of the twentieth century (i.e., comparing the years 1850–1900 and 1986–2005, 5–95% CI is 0.55–0.67 °C) [1, 2], and the predicted warming of 2–6 °C by 2100  have direly increased the need to understand the impacts of climate change. Interactions and feedbacks between climate and the health of forest ecosystems are expected . Changes in disturbance patterns mediated by climate warming are predicted to be the greatest impacts on forests in the coming decades . Current increases in frequency and intensity of biotic and abiotic disturbances to forest ecosystems have been attributed, at least in part, to climate change [1••], but uncertainties remain in a number of cases. Outbreaks of forest insects are major agents of mortality and ecosystem change in forests worldwide, and climate has been attributed to be an important driver of changes to disturbance regimes mediated by forest insects. Large-scale tree mortality resulting from drought, fire, and/or insect outbreaks can result in loss of carbon sinks and have feedbacks on climate change, with serious consequences for biodiversity and ecosystem function [6•, 7]. Disturbances have been defined as “disrupting the function of an ecosystem and changing resource availability or the physical environment” . Consequences of disturbance can result in loss of resilience accompanied by major ecological transformations . Forest insect outbreaks are major disturbances by native or non-native insects, as they can be synchronous over large geographic areas and cause region-wide mortality of host trees in a relatively short period of time [9, 10, 11•, 12]. Disturbance due to forest insects have been recorded to increase land surface temperature and cause declines in gross primary productivity [13, 14]. Predicted geophysical impacts of climate change include floods, droughts, and rise in sea levels. General circulation models predict the greatest warming at high latitudes in winter, a decrease in precipitation at mid-latitudes in summer, and an increase in frequency of extreme climatic events such as storms and droughts . Bark beetles, for example, can cause tree mortality following severe drought that is associated with warm temperatures, due to positive feedbacks on their populations from availability of susceptible hosts and favorable temperatures, amplified over spatial and temporal scales [10, 15•]. Predictions of insect outbreaks suggest changes in spatiotemporal patterns of defoliators and bark beetles. Bentz et al. predict that spruce bark beetle, Dendroctonus rufipennis, outbreaks may occur throughout the range of spruce in North America in the future. Outbreak dynamics of the spruce budworm, Choristoneura fumiferana, are predicted to change, move further north, and on to secondary host species [17, 18]. Similarly, cyclical outbreaks of larch bud moth, Zeiraphera griseana, are predicted to decrease in magnitude in optimal mid-elevation zones of the Alps, and to shift toward higher altitudes . However, predictions on future outbreak dynamics of defoliators remain uncertain as there is conflicting evidence on outbreak severity . In general, poleward and upward shifts of pests and pathogens have been documented, but predictions are complicated due to interactions and uncertainties associated with changing weather patterns, extreme climate events, and differing responses of plants and insects to these events . The consequences of higher frequency of extreme events are still poorly documented. For example, both positive and negative effects of climate on expansion and population dynamics can occur, as was observed in the pine processionary moth, Thaumetopoea pityocampa, during summer heat waves in 2003. This heat wave led to a collapse of the front edge population in France by killing early stages of the insect , while at the same time, triggering a record annual expansion in the Italian Alps by facilitating female flight . Insect populations are particularly responsive to climate change because of their sensitivity to temperature, short generation times, and high flight capacity. Observations of insect herbivory on an oak lineage during Quaternary climate change indicate that there was higher damage during warm and wet periods . In recent years, the magnitude and severity of epidemics have increased, with outbreak populations expanding to northern and high-elevation areas, where in the past, such disturbances were relatively rare [10, 18, 25•]. Long-term surveys and examination of outbreak dynamics of five species of European Lepidoptera between 1800 and 2011 revealed climate-driven changes in outbreak severity, cyclicity, and frequency, but there were mixed effects of temperature on outbreak activity [12, 26, 27]. It is often argued that the frequency and severity of C. fumiferana outbreaks in North America have increased in the twentieth century. A regional tree ring chronology study  represents the longest and most replicated reconstruction of outbreak dynamics in North America (1551–1995). They identified nine potential outbreaks and three uncertain outbreaks in a 400-year period and concluded that while outbreak frequency was higher during the twentieth century (~ 30 years) compared to the 1660–1850 period (~ 50 years), higher outbreak frequency might have occurred prior to 1660 (~ 28 years). While there is evidence that recent warmer temperatures have permitted the expansion of bark beetle outbreaks to higher latitudes and elevations than in the past, similar trends are more ambiguous to discern for Lepidoptera . Reports of forest decline are becoming more frequent and habitat shifts are occurring throughout the continental USA, bringing to the limelight the importance of interactions involving drought, insects, and fire . Climate and weather can have direct effects on trees, as drought and storms can weaken trees and predispose them to attack by bark beetles and pathogens. Climate can also have direct effects on insects as they are small poikilotherms with limited thermoregulation ability . For example, in the hemlock wooly adelgid, Adelges tsugae, nymphs were observed 3 months ahead of their normal phenology in December 2015, the warmest recorded December in Tennessee, USA, accelerating their development . Intense but not moderate drought appears to favor bark beetle performance and tree mortality, although its impact is not consistent among species . Warm temperatures result in changes in physiology and accelerated development in insects , particularly in northern latitudes where the growing season is short. Changes in phenology and phenological mismatches with host trees and/or natural enemies can alter trophic relationships and either favor or be detrimental to forest insect populations [34, 35]. Physiological changes in insects in response to temperature can facilitate changes in their distribution patterns . Field-based experimental manipulations of host plants  and insects to determine their relative responses to changes in temperature [37, 38, 39] can help predict the nature and extent of range shifts and to better understand how forest ecosystems will respond to climate change . In this paper, we review the current state of knowledge on the response of forest insects to climate change, with special attention to insect range expansion, population dynamics, and impacts on communities and forest ecosystems. We systematically analyzed literature from the past 5 years (2013–2017) for direct, indirect, and interacting effects of climate change on forest insect outbreaks and used reviews from earlier publications (e.g., [41•]). We compiled information from different biomes and geographical areas on the effect of climate change on forest insects, dealing with range expansion, population abundance, host shifts, and community interactions. We highlight the importance of using experimental manipulations to test the effect of climate warming on the phenology and performance of host trees, forest insects, and their natural enemies to better predict the response of communities and ecosystems to climate change. We identify gaps in current knowledge and suggest areas for future research that would advance our understanding of the impacts of climate change. We screened the peer-reviewed literature between 1948 and 2017 using Scopus on 7 July 2017 with “forests” AND “insect*” AND “climat*” AND “chang*” as our search terms. We obtained 1246 hits of papers containing these terms in the title, key words, or abstract. We focused our search on papers published between 2013 and 2017, and removed papers where the title or abstract revealed that they were not relevant. A total of 213 papers were selected for further analysis. These papers were classified based on whether they addressed (1) climatic drivers (temperature, precipitation, wind, CO2, O3); (2) their biomes (subarctic, boreal, temperate, subtropical or tropical); (3) forest type (natural or planted); (4) forest interactions (fire, drought, growth, dispersal, carbon, pathogens, trade); (5) feeding guilds (defoliators, bark beetles and wood borers, gall makers, sap suckers, seed and cone insects); (6) response of plants and/or insects (performance, phenology, voltinism); and (7) outcomes of climate change (range shift, host shift, outbreak dynamics). Forty of these papers were reviews or book chapters, which we then separated from the primary literature. We further added relevant papers that were accepted or in press and not picked up by Scopus. The range edge of forest herbivores is not easy to detect, especially when populations occur at low densities [41•]. Consequently, range expansion is difficult to document in nature, unless individuals are conspicuous, occur at high density, or cause obvious symptoms on trees. There are a few species of native forest insects for which range expansion has been precisely ascertained and related to climatic variables, including T. pityocampa  and bark beetles . In addition, introductions of non-native forest insects into novel geographic areas represent an opportunity to assess potential range expansion zones, although in this case, it is not always clear whether the expansion is limited by niche availability or climatic factors . Through analysis of case studies reported in Table 1, we address the above questions and provide an interpretation that could facilitate further research in this field. Range expansion linked to climate change has been observed in a dozen model species/groups in the boreal and temperate biomes, with mechanistic explanations provided for a few species. Increase in winter temperature appears to be the factor facilitating the survival and the occupation of geographic areas that were previously inaccessible due to harsh climate. Such a direct effect has been observed for geometrids associated with mountain birch, the autumnal moth, Epirrita autumnata, and the winter moth, Operophtera brumata, in the boreal areas of northern Europe, where eggs now encounter more favorable conditions during winter [46, 47]. In the case of T. pityocampa in Europe, larvae intensify feeding with more permissive winter temperatures, resulting in range expansion that is independent of population outbreaks [23, 42, 49] (Fig. 1). An interesting indirect effect involving the host plant has been hypothesized and modeled for C. fumiferana in Canada, which is associated with balsam fir as its main host and black spruce as a secondary host. Climate change is predicted to advance the phenology of the secondary host that is more abundant at the upper latitudinal edge, making it more susceptible to defoliation during outbreaks, and thus facilitating expansion of the outbreak area into higher latitudes [17, 18, 44, 45, 70] (Fig. 1). In Z. griseana, increased late winter and early spring temperatures create a phenological mismatch between larval hatching and spring budburst of larch at the optimal elevation belt (1800–2000 m), resulting in a shift toward higher elevations [51, 52]. Models are available to predict further range expansion of species for which the mechanism of response is known, and tests with independent data have shown they are reliable [71, 72]. However, generalization is difficult because of the specificity of reaction norms and ecological adaptations. Other species have been observed to expand their ranges, and often, climate change has been invoked to explain these patterns. Climate-matching models, that may or may not include species-specific parameters, have been used to predict future scenarios. These tools are useful to build hypotheses about mechanisms and to encourage scientists to design experiments tailored to individual species, although we should use caution before drawing general conclusions about the effects of climate change on range expansions [73, 74, 75]. Non-native defoliators also expand their range in response to climate change. In the case of the gypsy moth, Lymantria dispar, in North America, the reaction norm of larvae varies within the range, with local adaptations that may explain recent colonization of the upper part of the range . This indicates that selection can act on a relatively short time scale to enable populations to quickly adapt to new conditions caused by climate change. Bark beetles of the genus Dendroctonus have recently provided evidence of range expansion in North America where they are responsible for large outbreaks in different geographical regions. 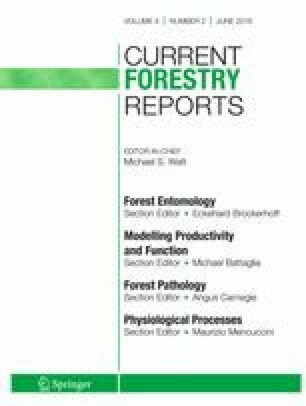 In the southeastern USA, the southern pine beetle, Dendroctonus frontalis, is moving north due to milder winters that enhance performance [54, 55]. In the north-west, the mountain pine beetle, Dendroctonus ponderosae, is expanding northward and eastward for the same reason [56, 57, 71]. These obligate tree-killing insects require a large number of individuals to mass-attack trees and overcome their defenses. As they can disperse for long distances, it is difficult to precisely define the edge of their range and document expansions. Most of what is known depends on the availability of precise information on the location of dead trees and the cause of death, which are now available due to modern surveillance technology. These species are difficult to detect when associated with weakened trees under endemic conditions, whereas damage and tree mortality become obvious during epidemics. Therefore, the range edge generally considered is that of the epidemic range, and the margins of the endemic range remain largely unknown. During the expansion of the epidemic range of North American Dendroctonus spp., a number of interactions directly or indirectly related to climate change have played an important role [58, 59•, 60, 61, 62]. Increase in temperature resulted in higher beetle performance, change in phenology, associated microbes, and their interactions. The northward and eastward expansion of D. ponderosae in Canada exposed a new host species, jack pine, to attack and successful colonization by the beetle, resulting in the invasion of previously unoccupied regions [60, 63•] (Fig. 1). Bentz and Jönsson  review quantitative models that predict the influence of temperature and precipitation on bark beetle outbreaks. Ecological niche models such as Maxent are now used for several species to match suitable climate habitats and predict range expansions [63•]. Although we have evidence of range expansion for other bark and wood-boring insects, the mechanisms have not yet been clearly explained. Of these, two non-native insects that became invasive in various parts of the world, the emerald ash borer, Agrilus planipennis , and the Sirex woodwasp, Sirex noctilio , have large expansion potential in their newly invaded areas. Human-mediated transportation has been attributed to have facilitated the expansion of A. planipennis in the USA. Two native species feeding on seedlings, one scolytine beetle  and one weevil , have been considered in climate-matching studies, and in both cases, there is potential for range expansion with increasing temperature under different scenarios of climate and host plants. Similarly, climate-matching provides estimates of range expansion for a few species of non-native gall makers, such as cynipid gall wasps [66, 67] and sap suckers. The best studied species is A. tsugae in eastern North America, which is expanding its range due to low winter mortality, fast development rates in early spring [31, 68, 69], and improved potential to overcome cold snaps . Estimates of the speed at which forest insects are expanding are available for a few species and rely mainly on comparing the edge of the expansion front over time, varying from a few hundred meters in T. pityocampa in the Alps, to hundreds of kilometers in C. fumiferana in Canada. Although this is largely dependent on the local population density of insects, dispersal potential alone does not determine expansion. Climatic and host-related factors in the new range are crucial for the successful establishment of expanding populations. There are, however, cases when dispersal occurs under particularly suitable climatic conditions, such as warm nights that favor the spread of moths at the range edge . In D. ponderosae, rates of spread and thereby, range expansion, can be determined using dispersal rates and population growth rates that are governed by host tree interactions as well as climate . Inadvertent human transportation of insects can facilitate range expansion in both native  and non-native pests [53, 78]. In non-native pests, it can be difficult to disentangle active from passive dispersal, unless genetic fingerprinting of expanding populations reveals how they arrived in the new range. The effects of climate change on insect performance are important to predict population trajectories of forest insects and the impacts of outbreaks on forest ecosystems [63•] (Table 2). Temperature and precipitation have direct impacts on trees and are major drivers of population change in insects. Most of the data available so far on forest insect epidemics are restricted to temperate and boreal ecosystems. In temperate climates, insects respond positively to temperature  and their abundance can peak at warm temperatures . Warm spring temperatures can also favor tree growth, advance budburst, and produce high-quality foliage that can potentially aid early larval feeding. Hot, dry summers can modify tree defenses and resistance to herbivory. Elevated temperature and ozone can increase the emission of volatile organic compounds and modify herbivory . Temperate insects are generally cold tolerant and exhibit adaptations such as diapause and super-cooling tolerance that can facilitate shifts to northern latitudes or higher elevations even with a slight increase in temperature . However, warm temperatures can be deleterious by disrupting development rates and diapause requirements . Climate change can therefore either favor outbreaks, or disrupt trophic interactions, and decrease the severity of outbreaks (Table 2). For example, variation in precipitation negatively affects caterpillar parasitism . Also, outbreaks of Z. griseana across the Alps have collapsed since the 1980s , even though recent temperatures are warmer than those of the past. In boreal and temperate defoliators, an increase in temperature generally favors population growth. Increasing temperature and precipitation had positive effects on tree growth during an epidemic of C. fumiferana , potentially increasing early instar larval survival. Tree ring chronologies of jack pine budworm, Choristoneura pinus, revealed that cool May temperatures followed by warm, dry summers favored outbreaks on jack pine and scots pine between 1956 and 1986, resulting in five outbreaks of C. pinus, with jack pine being primarily affected, and scots pine showing a 1-year lag in defoliation . Similar dendrochronological evidence suggests that western spruce budworm, Choristoneura occidentalis, outbreaks increased after 1890 in northwestern USA when fire disturbance decreased and that outbreaks generally began near the end of warm, dry periods . In Europe, populations of T. pityocampa respond positively to higher than average summer temperature and spring rainfall, although the mechanisms are unclear and patterns vary depending on local environmental conditions . Increased outbreak frequency at upper range limits have been observed in several Thaumetopoea spp., but the link with climate warming is still to be ascertained [91•]. Higher temperatures did not affect survival, but reduced development time of sawflies by up to 41% , potentially increasing the risk of outbreaks. If larval development time is shorter at warmer temperatures, predation risk could decrease. However, interactions can be complex, as performance of natural enemies can also improve with warmer temperatures . Positive relationships between temperature, drought, and herbivory do not necessarily occur. Dendrochronological analyses of Z. griseana outbreaks over 500 years reveal periodicities of 4, 8, and 16 years throughout the time series, except during 1690–1790, and since 1980, suggesting that disruption of periodicity may be related to changes in climate . Although still peaking at 8–10-year intervals, present outbreaks show a ca. threefold decrease in larval density compared to the outbreaks that occurred before the 1970s (Roques, unpublished data). Manipulative forest warming mesocosm experiments enable us to quantify the relative responses of host trees and their herbivores to changes in ambient temperature. Studies using forest tent caterpillar, Malacosoma disstria, and its host trees under controlled conditions examined its relative response to changes in temperature [37, 38, 39]. Under warmer temperature regimes in late winter and spring, tree phenology generally advanced more than insect phenology, altering synchrony between O. brumata and oak budbreak in the Netherlands between 1975 and 2000 [83, 108]. However, in some years, eggs may hatch up to 30 days before oak leaves appear, although this effect is not predicted to be consistent. Genetic variability in the date of egg hatch, and possible host shifts, are likely to allow adaptation through severe selection in the original population . In dry, tropical forests, high temperature and low precipitation decreased growth and development of Saturniid caterpillars feeding on Salicaceae, compared to cooler, wetter conditions . Young oak trees did not suffer greater herbivory when exposed to L. dispar larvae under drought conditions , and inadequate winter chilling disrupted synchrony between L. dispar and its host trees, potentially decreasing the severity of outbreaks . In four species of leaf beetles, Chrysomela spp., that feed on willows in subarctic Russia, spring and fall temperatures increased by 2.5 to 3.0 °C over a 21-year period (1993–2014) . While host plant quality increased with temperature, beetle abundance did not increase. Chrysomela lapponica populations actually declined due to the impact of natural enemies and declining pollution, suggesting that changes in air quality might confound data on long-term population dynamics. Trophic interactions can affect population abundance and outbreak dynamics. In subarctic mountain birch forests, defoliation rates are higher during outbreaks in high elevations. Pepi et al. showed that predation rates on E. autumnata and O. brumata larvae were almost twice as high in low versus high elevation sites, and that release from predation pressure at high elevations can favor outbreaks in these cooler habitats. It therefore appears that top-down effects can override bottom-up effects of climate warming in some tri-trophic systems. Population abundance and outbreaks of bark beetles are generally related to drought, except for D. frontalis, for which the relationship with precipitation is obscure . D. ponderosae outbreaks occur throughout western North America and the recent outbreak in British Columbia, Canada, was unprecedented in its scale and impact . By the end of the outbreak, populations of the beetle had breached the Rocky Mountains, and moved into the boreal forest where host shifts and reproduction on jack pine, a novel host species, have been recorded. Other species of potential hosts include red pine and eastern white pine. Novel hosts exhibited lower defenses to attack than co-evolved hosts such as lodgepole and ponderosa pine [96•]. Warmer temperatures associated with climate change are a significant factor in recent outbreaks and range expansion of D. ponderosae due to positive influences on development phenology and winter survival [110, 111]. Diapause and winter survival influence voltinism and population abundance. Whether or not D. ponderosae population structure and voltinism would change with warmer temperatures has been speculated. Along latitudinal and elevational gradients in the western USA, the number of days required to complete a generation was similar in both cool and warm sites. [61, 62]. Thermal units required to complete a generation were lowest at cool sites, but individuals did not become bivoltine even at the warmest sites. The need to maintain cold sensitive life stages in the winter prevents bivoltinism from evolving in this species [61, 62]. There is evidence that the invasion of populations into more northern latitudes was possible due to changes in cellular and metabolic functions, with genome scale differentiation, that allow populations to better withstand cooler northern climates and facilitate longer dispersal distances. Such landscape-wide selective adaptation has permitted D. ponderosae populations to colonize and reproduce in previously inaccessible areas [59•]. The likelihood of bivoltinism in D. rufipennis as the climate warms is also uncertain because it inhabits relatively colder habitats that necessitate obligate winter diapause and slow developmental rates . In its coldest locations, D. rufipennis is semivoltine, having a generation every 2 years. In these areas, cool temperatures experienced by larvae can result in a facultative pre-pupal diapause, followed by an obligate diapause by teneral adults the following winter. In a warmer climate, accelerated development could result in populations transitioning to univoltine life cycles due to elimination of the pre-pupal diapause phase . The phenology of the European spruce bark beetle, Ips typographus, has been predicted with models such as PHENIPS  to estimate flight periods, diapause, and development in the context of climate change. Berec et al. predict that changes in voltinism will not exceed two generations per year, as they expect only minor changes in development time under current climate change scenarios. At the southern edge of the range, however, under warm autumn conditions, a third generation can be produced, with emerging beetles dispersing in the spring and summer . Multivoltine populations of I. typographus have resulted in high timber loss at low and medium elevations of the southeastern Alps . In the longhorn beetle, Monochamus galloprovincialis, a vector of the invasive pinewood nematode, temperature fluctuations decrease longevity, while there is no effect of ambient higher temperatures on survival . Another highly invasive species, A. planipennis, is predicted to drive ash, Fraxinus spp. to extinction in North America, as current and future winter temperatures may not be cold enough to cause significant mortality of larvae in much of its invaded range . Voltinism of the pine weevil, Hylobius abietis, is expected to increase with climate change as well as the impact on regeneration, with severe implications on management practices [100, 114]. Seed and cone insects are poorly studied in relation to climate change response. Since most species are host-specific and depend on tight synchrony with cone development to share the cone niche [115, 116, 117], climate change is likely to affect interactions between cones and insects as well as between insect species. However, adult emergence of three species of larch cone flies, Strobilomyia spp., appeared to adjust tightly to the earlier blossoming of larch in the Alps, which has advanced 12–15 days since the 1980s (Roques, unpublished observations). Reproductive loss occurred in about 85% of black spruce, Picea mariana; balsam fir, Abies balsamea; eastern larch, Larix laricina; and white spruce, Picea glauca; sampled across three treeline zones in the Mealy Mountains in Labrador, suggesting that cone insects can limit treeline expansion due to climate change . Drought prompts outbreaks of the green spruce aphid, Elatobium abietinum, only at moderate levels of tree stress, and climate change seems to facilitate outbreaks . In Australia, outbreaks of eucalypt psyllids are dependent on rainfall affecting changes in host quality, although the roles of climate change and CO2 enrichment remain to be clarified [104, 105]. Impacts of insect outbreaks due to climate change effects on forest ecosystems have become evident in recent years and are summarized in Table 3. Outbreaks impact forest ecosystems and the mechanisms are dependent on the insect guild and region . Impacts can vary from fluctuations in tree growth to changes in the succession of the ecosystem, whereby forest regeneration may not occur to replace dead trees. Although the relationships between climate change and outbreak propensity of forest insects are still a matter of discussion (see previous chapter), some recent outbreaks (e.g., D. ponderosae), have large impacts on the ecosystem and can generate feedbacks on climate change [6, 133]. The mechanisms by which insect outbreaks may affect ecosystem dynamics are numerous, and in the analysis below, we address them in defoliators and bark and wood-boring insects. The impact of defoliation in boreal ecosystems are the best-known models. The C. fumiferana outbreak in Canada is linked to an increase in both tree mortality and fire ignition. However, observations during the past few decades and predictions based on climate scenarios document an overall reduction of impacts or a shift to higher latitudes [119, 120]. In northern Europe, the impacts of natural and simulated defoliation by geometrids on the growth of mountain birch, under controlled conditions mimicking climate change, do not appear to be important, and may depend on interactions with water and nutrient availability [121, 122]. The effects of geometrid defoliation in the outbreak range expansion area are instead rather conspicuous, as they involve a shift from oligotrophic to eutrophic communities in the understory layer , with consequences for the abundance of mammalian herbivores [25•]. An interesting study on the abundance of an insect herbivore of an understory plant along a temperature gradient has shown that insect abundance is temperature-limited while the plant is not, indicating a potential for increased herbivory with climate change . In North America, defoliation of M. disstria appears to reduce the capacity of aspen to cope with climate change-related droughts, although the mechanisms are not clearly elucidated . Similarly, defoliation of the Siberian moth, Dendrolimus sibiricus, on fir has been associated with climate change in central Asia, and with significant tree mortality . The recent outbreak of D. ponderosae in North America was a magnitude larger in area and severity than previously recorded outbreaks, resulting in questions on long-term impacts of tree mortality on forest ecosystems. The range of one of its dominant pine hosts, lodgepole pine, appears to shrink at the lower edge, as seedling recruitment does not compensate for the accelerated mortality of trees . Wildfires and bark beetle outbreaks are often correlated, as they respond to common climatic drivers, rather than to their interactions [128, 129]. The outbreak converted forests that were net carbon sinks into net carbon sources for several years during following the outbreak, due to severe reduction in net primary production [6, 133]. However, simulations of long-term impacts on the carbon cycle and regeneration of killed stands of lodgepole pine predict potential recovery from tree mortality, depending on local climatic conditions and natural vegetation [130, 131]. In the Greater Yellowstone ecosystem, high-elevation whitebark pine that was previously not affected by the beetle due inhospitable climate is now being killed by D. ponderosae . It appears that whitebark pine mortality will continue, and regeneration will be slow , making research and forest management high priorities in this vulnerable ecosystem. Climate change is predicted to disrupt trophic interactions if one or more members of the community respond positively or negatively to changes in temperature or precipitation. In particular, species may shift their phenology at different rates, having cascading and potentially deleterious effects on the community (Table 4). A 40-year time series of phenological events in plants, birds, reptiles, insects, and fungi in Russia revealed that phenology advanced most significantly in plants, compared to other taxa. However, inter-annual variation in plants, reptiles, and insects was highly synchronized, indicating that there was a community-level shift in phenological synchrony , suggesting that communities may have a certain adaptive capacity to resist changes in phenological synchrony. In general, with increasing climatic variability, parasitism levels are predicted to decrease as host-specific parasitoids would have difficulties tracking host populations . Parasitism rates and parasitoid diversity also decreased with elevation, with endoparasitoids of endophagous insects being most protected from the impacts of climate change . Outbreaks of phytophagous insects are therefore predicted to increase because of lower parasitism rates as the climate warms [106, 144]. Herbivory is associated with budburst and tree growth, both of which respond strongly to temperature. Herbivore density, diversity and consumption of foliage on high latitude genotypes of silver birch, Betula pendula, were correlated with birch phenology, providing evidence that climate indirectly affects herbivore communities . While it is generally proposed that climate-induced herbivory will increase at higher latitudes, this has seldom been tested. Diversity and abundance of leaf miners of birch from 59° to 69° N in Europe decreased with latitude , due to a stronger response to summer temperatures at northern latitudes, suggesting that herbivory will likely increase at higher latitudes with climate warming. Host plant preferences can also change at warmer temperatures. Jing et al. measured developmental parameters of three defoliators and their preferences for five host plants at temperatures from 16 to 31 °C and showed that with increase in temperature, development time was shorter, and survival rate and fitness increased. A shift in feeding preference for host plants also occurred, leading to increased herbivory on certain plants and a potential altering of forest communities. Sensitivity of communities to climate warming can be studied using elevation gradients to monitor community responses to variation in temperature and precipitation. In a temperate forest on Changbai Mountain in China, ground beetle and geometrid moth assemblages shifted more strongly with altitude compared to changes in vegetation, suggesting that climate change will facilitate a shift in their distribution, and raising concerns about extinction of mountain-top communities that may be unable to move further uphill . The effect of future atmospheres on forest insect communities have also been explored with CO2 enrichment studies . The effects of CO2 and O3 on herbivore abundance and species richness did not significantly alter aspen arthropod community composition, but occasionally altered birch insect community composition, suggesting that spatiotemporal responses of insect communities are difficult to predict, because of their variability. Changes due to climate warming may not necessarily result in serious, long-term deleterious effects on communities or ecosystems. Population dynamics of subarctic moth assemblages were observed over 32 years in Finnish Lapland where there were rapid increases in temperature and precipitation in the study site . Even though populations increased over this period, per capita rates of change were negatively associated with climate change variables in time series models. It appears that negative effects of climate change on population growth can be buffered by other ecological factors [135, 139]. In Europe, trapping bark beetles along an altitudinal gradient revealed that there was no effect of elevation on species richness. There was a positive relationship between the abundance of aggressive tree-killing beetles and temperature, while less aggressive species exhibited the opposite trend . The authors suggest that with warming, spruce forests may face increasing damage from aggressive species, threatening growth and survival of Norway spruce at low elevations and southern latitudes. Similar patterns were observed in Mexico in non-aggressive, pine-infesting bark beetles along an altitudinal gradient . Species richness and abundance were highest at the lowest elevation and there was a positive relationship between temperature and bark beetle abundance. At lower elevations, projected rise in temperature is predicted to cause higher damage by bark beetles on susceptible tree species. Predators, competitors, and mutualists play an important role in the population dynamics of bark beetles. Predators such as woodpeckers, clerid beetles, and flies can cause high mortality on adult beetles and larvae . The direct impacts of warming on predation rates and bark beetle performance are not known, and we need to consider phenological responses of natural enemies to changes in temperature regimes in future studies [15•]. Warm temperatures can directly and indirectly influence the composition of mutualistic fungi and determine beetle fitness. Simulations of temperature variability on persistence of fungi in mutualistic associations with D. ponderosae showed that thermal migration between warm and cool conditions would stabilize mutualisms in the long-term . If climate change forces one of the main mutualists out of the association, beetle fitness and outbreak potential could decrease . Ecological factors and community interactions appear to moderate the responses that warming might elicit. In open-top warming experiments, populations of the aphid, Chaitophorus populicola, were higher when tended by mutualistic ants, regardless of temperature . In their study, plant stress decreased with warming only when both ants and C. populicola aphids were associated in mutualistic interactions, suggesting that such interspecific interactions could buffer the effects of warming on herbivore communities. Temperature-based predictions of beetle abundance from several families in South Korea indicate that species can vary in their response to temperature . Of the 18 species they analyzed, 6 were predicted to increase in abundance and 12 were predicted to decrease. They predicted that as the climate warms, more beetle species will decrease in abundance. There are very few studies on climate change and tropical insect communities. A unique study using a 137-month time series of 100 species of fruit-feeding butterflies in Uganda showed that temporal shifts in peaks of butterfly abundance were correlated with temporal shifts in peaks of vegetation greenness depending on temperature and precipitation, and that assemblages of ENSO warm phase years differed from other years . Projected changes in climate can be used to predict patterns of species distribution and richness. Distribution models for 43 species of flightless Australian ground beetles suggest that with upward shifts in distribution, species currently confined to lower and drier mountain ranges will be more vulnerable to climate change impacts than those restricted to the highest and wettest mountains. Poor ecological conditions would make communities more susceptible to the negative consequences of climate change. Information available on the relationships between climate change and forest insects has increased in the last few years. The effects of climate change are clear in some species, but cannot be generalized to all species, even within the same guild or biome. The direction of the effect of climate change can vary from positive to negative and it is often difficult to disentangle indirect and direct effects, as well as tri-trophic interactions. Predictions based on the link between climate change and insect disturbances are important, as insects are critical to forest succession [5, 149]. Modeling is a useful tool, although predictions can be misleading when input data are scarce or not appropriate. The mechanistic nature of process-based phenology models permit predictions of population dynamics in a changing climate [63•]. In both defoliators and bark and wood-boring insects, relationships between tree mortality and environmental factors provide strong evidence that changes in magnitude, frequency, and intensity of recent outbreaks are driven by direct or indirect effects of climate. Warm temperatures can decrease winter mortality and diapause requirements, thereby shortening generation time and increasing voltinism. Indirect positive effects on insects can occur through deleterious effects of warm temperatures and drought on defenses of host trees. Species-specific responses to temperature can result in variable impacts of climate change on outbreak behavior. Several species of defoliators and bark beetles now have higher survival and reproductive rates at high elevations and more northern latitudes than in the past. Populations are therefore expanding into new ranges, affecting novel and evolutionarily naïve host species. Novel host species are not equipped with the same defense capacities as co-evolved hosts and can suffer greater damage from herbivory. Whether or not forest ecosystems will be resilient to disturbance regimes they have not co-evolved with, requires long-term monitoring of forest regeneration and ecosystem impacts. Climate change can disrupt trophic interactions depending on species-specific responses of individuals at each trophic level to increase in temperature. More studies are needed on the temperature dependence of functional responses of predator-prey systems to predict the outcomes of climate change scenarios. To this end, functional response settings added to greenhouse studies or field mesocosm experiments can be used to evaluate physiological and behavioral responses to increase in ambient temperature across trophic levels and assess the extent to which climate change will alter trophic interactions. Mechanistic studies linking climate change variables to plant and insect performance are needed, especially when factors other than temperature are considered. Microcosm studies with CO2 or O3 enrichment treatments, or rainfall simulations with closed-top chambers can be used to measure plant and insect responses to modified conditions under climate change. Historical datasets about herbivory in forests can be used to reconstruct damage dynamics in relation to climate change, provided the role of the main variables can be disentangled [102, 150]. Climate change studies conducted so far concern mainly temperate and boreal forests. More research is needed on the impact of climate change on species and communities in subtropical and tropical forests. The authors thank Paolo Paolucci for drawing Fig. 1. Comments and suggestions from two anonymous reviewers helped improve the manuscript. The authors thank the University of Padova for a visiting scientist grant 2017, the Canadian Forest Service for research funds (O&M) and the Natural Sciences and Engineering Research Council of Canada for a Discovery Grant to DSP. This article contains no studies with human or animal subjects performed by the authors. Thompson LM, Faske TM, Banahene N, Grim D, Agosta SJ, Parry D, Tobin PC, Johnson DM, Grayson KL. Variation in growth and developmental responses to supraoptimal temperatures near latitudinal range limits of gypsy moth Lymantria dispar (L.), an expanding invasive species. Physiol Entomol. 2017; https://doi.org/10.1111/phen. Tobin PC, Turcotte RM, Blackburn LM, Juracko JA, Simpson BT. The big chill: quantifying the effect of the 2014 north American cold wave on hemlock woolly adelgid populations in the central Appalachian Mountains. Popul Ecol 2017; https://doi.org/10.1007/s10144-017-0589-y. Pepi AA, Vinstad OPL, Ek M, Jepsen JU. Elevationally biased avian predation as a contributor to the spatial distribution of geometrid moth outbreaks in sub-arctic mountain birch forest. Ecol Entomol. 2017. https://doi.org/10.1111/een.12400. • Rosenberger DW, Venette RC, Maddox MP, Aukema BH. Colonization behaviors of mountain pine beetle on novel hosts: implications for range expansion into Northeastern North America. PLoS ONE. 2017; https://doi.org/10.1371/journal.pone.0176269. Uses manipulative experiments to test susceptibility of naïve host species to a range-expanding, tree-killing pest. Meigs GW, Zald HSJ, Campbell JL, Keeton WS, Kennedy RE. Do insect outbreaks reduce the severity of subsequent forest fires? Environ Res Lett. 2016; https://doi.org/10.1088/1748-9326/11/4/045008.